Obviously I’m not quite finished with Seamus Heaney! This is my third post inspired by his life and work since his death on August 30th, just more than a week ago. The outpouring of tributes to him since his death has been extraordinary. Two of those stand out for me. One, not unexpected, was from the celebrated American poet Jane Hirschfield (1955 – ) who knew Heaney well and whose tribute included a picture taken by Heaney’s wife of Hirschfield snuggled beside him in April in Rome. The other, unexpected but so appreciated, was from the host of CBC’s Sunday Morning program, Michael Enright. Here some words by Hirschfield: You could count on such honesty from Seamus, and on the reliable eloquence, the twin brogues of accent and brilliance, though you could never predict the particulars they might be couched in—a rook, a root, a memory, some anthracite-compact quotation. In his presence and in his words, you felt the wholeness of his embrace of being, and also the burnish of original seeing—as if the world were a bas-relief being viewed from some different, sharpened angle of sun. And you felt, quite simply, more alive for his aliveness, in life and on the page. What a great way to measure the power of a poet – for a reader to feel more alive for his or her [the poet’s] aliveness, in life and on the page. Here is a wonderful example of the aliveness he brings to the page in the description of the day-to-day things we can become so habituated to and ignore. I especially love the line: the china cups were very white and big. The least likely poetic line but I think he pulls it off! With a very! And with the “issness” he creates. I am in the kitchen with him, full of its everyday marvels. Poets know about human pain and human fear. It is part of their mandate to write about our fears, not necessarily to assuage them, but only to describe them accurately so that we know what we are dealing with. Our poets act as the counter to our fears. Our poets don’t change the world, but instead change the way we look at it. They provide a glimmer of something better. Heaney grew up in the hard-scrabble country of rural Northern Ireland. He lived through the “Troubles,” the horrific sectarian violence of the ’70s and ’80s. If anyone had reason to live a fearful life, surely it was him. But his art and his insight are a constant denial of the corrosive power of fear. Horizons rigged wth windmill’s arms and sails. Still more in place when mirrored in canals. Of glar and glit and floods at dailigone. My silting hope, My lowlands of the mind. time to be dazzled and the heart to lighten. This captures Heaney’s trademark yes and no. What a turn in the sonnet. My silting hope. My lowlands of the mind. Heaviness of being. A big no. Then, the yes of crediting marvels. And not the miraculous. But the tree-clock of tin cans/ The tinkers made. The day to day marvels when we notice the beauty that exists alongside with life’s ever-present darker realities. This is where poets accomplish what Enright talks about. And talk about hope. The last two lines: So long for air to brighten,/ time to be dazzled and the heart to lighten. Back to your Nobel lecture. You recited a line from your poem, where the narrator says, “Walk on air against your better judgment.” You offered this line as an instruction to yourself and all who listened. What does that mean? And this takes us back to the marvelous (in both senses of the word) of the poem that introduces this blog post. 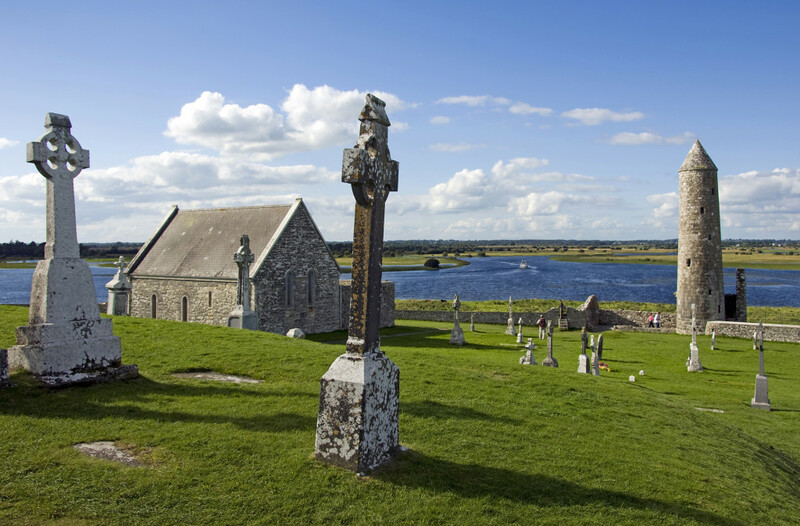 I visited the holy site of Clonmacnoise (see picture above), site of a former monastery, now in ruins but no less affecting, more than ten years ago. It is situated beside a river surrounded by such beauty. Heaney in his poem reminds us that perspective is everything. The abbot in the poem is afraid the out-of-the-world man will drown inside their unbearable world but quite the opposite happens. The man climbs back out of the marvelous as he had known it. What I think is marvellous about this is that Heaney is reminding us two forms of the marvellous: seeing this other-world apparation of a floating ship, the marvellous contained in so many myths and cultural stories, and the quotidian marvellous we overlook such as the earthly beauty of Clonmacnoise or a tinker’s tree clock of tin cans. And when Heaney conjurs out of thin air it seems, the marvellous, even his china cups very white and big, I can become less afraid and be more present in the now. I am so grateful to Enright for pointing this out as a poet’s work! Here is an example of this work through a poem by the American poet Stanley Kunitz (1905 – 2006), twice the poet laureate of the United States and a man who lived with his full capabilities until he was past one hundred years old. That’s enough on its own to dispel fear! But his poem below is one of those I cherish as a poem that encourages me to hope. There are many gritty and not so marvellous images in this poem but at the end it sounds a triumphant note: I am not done with my changes. The work of a poet. Giving us both no (How can I be reconciled to my feast of losses)and the yes but always saying the yes loud and clear, maybe not in every poem but in enough of them! In a blog posting focussed on Heaney’s last words it seem only fair to give Seamus Heaney the last words here, as well. Here is an excerpt from a series of inrterview Heaney did with Dennis O’Driscoll in the book Stepping Stones in 2008. Could it be said that you don’t fear death? Certainly not the way I’d have feared it sixty years ago, fearful of dying in the state of mortal sin and sifferring the consequences for all eternity. It’s more grief than fear, grief at having to leave ‘what thou lovest well’ and whom thou lovest well. Grief more than fear. Yes. This entry was written by Richard Osler, posted on September 9, 2013 at 11:45 am, filed under Poetry and tagged Clanmacnoise, Clearances, Jane Hirschfield, Lightenings, Michael Enright, Noli Timere, Seamus Heaney, The Cure at Troy. Bookmark the permalink. Follow any comments here with the RSS feed for this post. Hi Richard, thank you for your postings. Yes, trust Michael Enright to hone in on the essence of things. Then Scott Symon on his postings when his mother was dying that fitted so well.